Home > Shop By Brand > Griot's Garage Car Care for the Perfectionist > About Griot's Garage > Griots Garage Heavy Duty Wheel Cleaner 35 oz. Griots Garage Heavy Duty Wheel Cleaner 35 oz. Breaks down road grime and brake dust without acids! Griot's Garage Heavy Duty Wheel Cleaner packs a powerful punch against road grime and brake dust, yet it's safe and gentle on all wheel finishes. 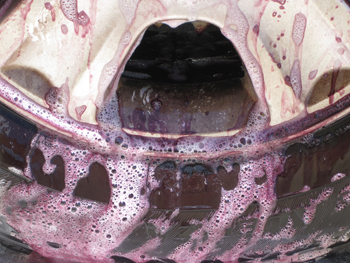 The high viscosity formula clings to the wheel face to deliver targeted cleaning muscle. Use Griot's Garage Heavy Duty Wheel Cleaner on your painted, chrome, powder coated, and uncoated aluminum wheels with confidence. 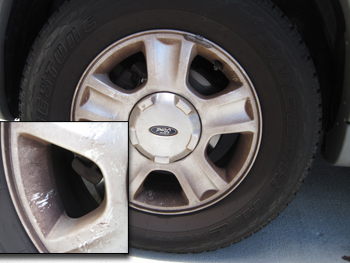 Are your wheels covered in brake dust? Has it been weeks since you last cleaned them? You need Griot's Garage Heavy Duty Wheel Cleaner. Only Griot's Garage Heavy Duty Wheel Cleaner provides strong cleaning power in a pH-balanced, non-acidic, non-caustic formula. It's designed for car enthusiasts like you, who want clean wheels without sacrificing the safety of the wheel finish. 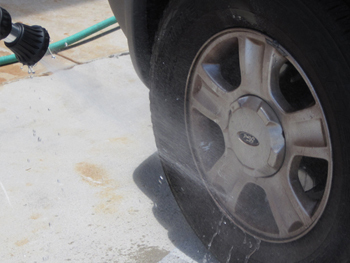 Watch Griot's Garage Heavy Duty Wheel Cleaner work! It changes color as it releases brake dust and greasy grime from the wheel. It is clear in the bottle but turns red as it encounters soil. You can see it working! 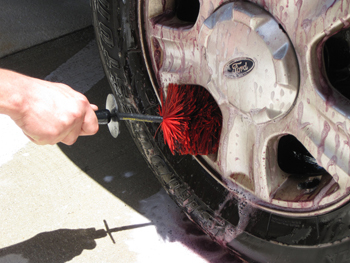 Griot's Garage Heavy Duty Wheel Cleaner requires just a little agitation with a soft-bristled wheel brush to help release brake dust. 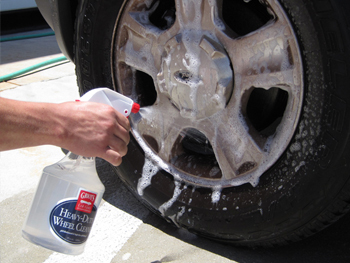 Unlike spray-on, rinse-off wheel cleaners, Griot's Garage Heavy Duty Wheel Cleaner contains no caustic chemicals. 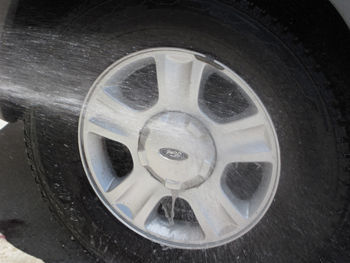 It's a safer way to clean all wheels. 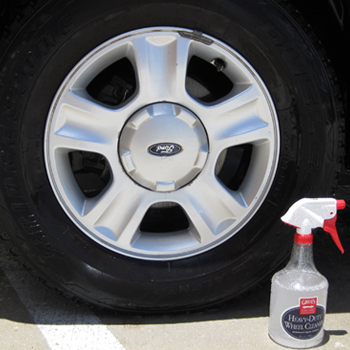 Use Griot's Garage Heavy Duty Wheel Cleaner to tackle dirty wheels with a gentle touch. Griots Garage Heavy Duty Wheel Cleaner 128 oz. Griots Garage 6 Inch Random Orbital PolisherGriots Garage 3 Inch Orbital PolisherGriots Garage 3 Inch Orbital Polisher KitGriot's Garage Random Orbital Perfect Starter Kit - Free Bonus!Griots Garage & Meguiar’s Paint Perfection Kit - Free Bonus!Griot's Garage Random Orbital Wolfgang Duo Free Bonus!Griots Garage Water Resistant Trunk BagGriots Garage Favorite Gallons Collection Griots Garage All Wheel Cleaning Kit Griots Garage Heavy-Duty Wheel Kit Griots Garage Glass Care KitGriots Garage Interior Kit Griots Garage Leather Care Kit Griots Garage Polish & Wax Kit Griots Garage Polish & Poly Wax Kit Griots Garage Swirl Remover Kit - Free Bonus!Griots Garage Random Orbital Polisher & Pad KitGriots Garage Random Orbital Polish & Poly Wax Kit Free Bonus!Griots Garage Random Orbital Polish & Wax Kit Free Bonus!Griots Garage Polisher Club KitGriots Garage Car Wash 16 oz.